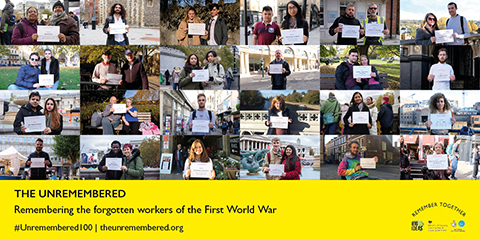 The British public is being asked to take part in photo tributes to the Labour Corps from around the world, whose sacrifice and contribution to World War One is rarely remembered. 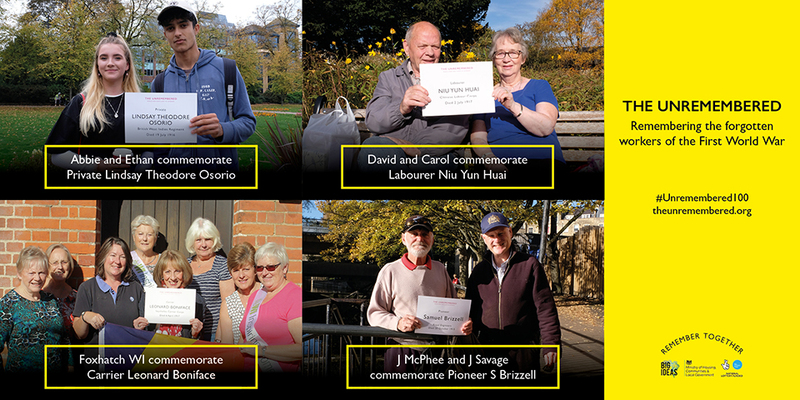 As part of The Unremembered national campaign, community groups and schools from across the UK are invited to take photo tributes holding up the names of individuals who served in non combatant roles but lost their lives in the First World War. As part of the Armistice Centenary commemorations, these photo tributes will be shown on digital billboards in public spaces such as at bus stops and on roadsides throughout the month of November. The campaign will launch with 100 names of men and women who lost their lives in the First World War chosen to represent those from India, West Africa, East Africa, South Africa, Egypt, Canada, China, The Caribbean and the UK. Big Ideas is collaborating with the Out of Home advertising industry and as result, people’s photo tributes will be shown in public spaces such as at rail stations, bus stops and on roadsides on Clear Channel, JCDecaux, Exterion Media and Global Outdoor digital billboards throughout the month of November. The Labour Corps supplied the army with weapons and ammunition, food and fodder, water and fuel. They built and maintained roads and railways. British and Allied Forces struggled to cope with the demand for manpower after the huge losses of men during the Battle of the Somme in 1916. From January 1917, tens of thousands of people travelled thousands of miles to join the war effort. Although they rarely saw service in the frontline, many died or were seriously injured. Today their contributions and sacrifice are all but forgotten. The Unremembered: World War One’s Army of Workers is a First World War commemoration programme led by Big Ideas and funded by the Ministry of Housing, Communities and Local Government (MHCLG) and a National Lottery grant from the Big Lottery Fund. The project commemorates the Labour Corps from across the world who served in the First World War. To take part, people can email theunremembered@big-ideas.org. They can indicate if they are interested in a particular Labour Corps. They will then be given an Unremembered100 name (for their photograph). If they include their postal address, they will be sent an Unremembered Map so they can find out more. Up to £200 of associated expenses can be reimbursed to community groups and schools who want to take part. The photos that will appear in November will be selected by the end of October.